Prepare brownie mix in a 9 by 13 inch pan according to package directions and cool completely. Cut into 1 inch squares. Brownies will be extra thick since 2 packages were used. 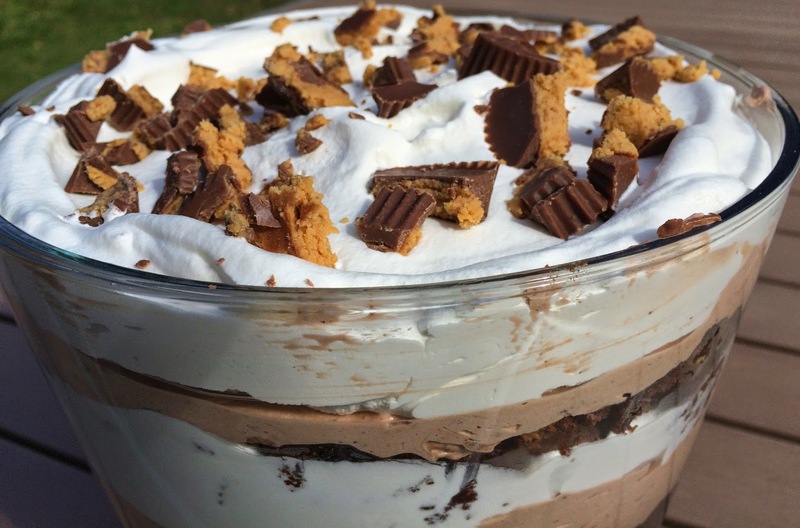 In a trifle bowl or deep glass serving dish, place half of the brownies, half of the pudding mixture, half of the 12 ounce container of whipped topping and half the crushed peanut butter cups. Repeat layers. Refrigerate 8 hours before serving. Note: I often substitute the boxed brownies for store bought to avoid using the oven all together. If you love peanut butter as much as I do, make sure to add extra peanut butter cups to compensate! Check out the rest of the Top Ate All Time Favorite Desserts.